Some limited info below, along with a interesting Item in the collection and a couple of new additions. I wanted to post these next 2 images asap. I wrote to a person in Finland, and hopefully after he gets done looking at it and doing a little more research. I hope to have had a couple of questions answered. Take a look!, I first want to thank Ilkka J. from Finland. 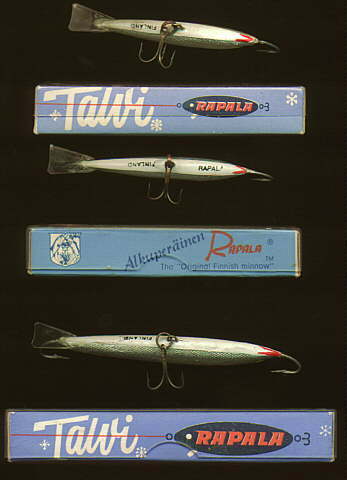 He has a great photo of a Early Rapala. 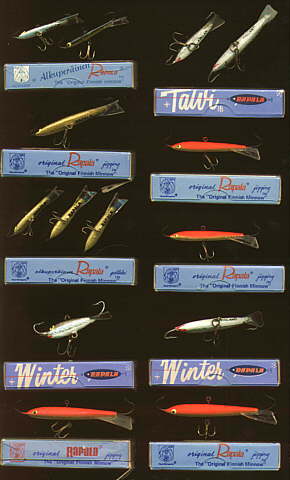 Well it looks as though I'll start a section for these and other models of the Rapala ice fishing equipment and what a way to start off then the first listing below. Teho (folding)in the box. View it! I have seen this only in 1 catalog that I have. I haven't ever seen one in person and now it looks like I've finally added it to my collection. This is one of the better "Field Finds" I had in awhile. Here are a few 'fun" photo's. Some of them are new and will be used during the upcoming season, others will stay in the collection. Just a bunch of scans that I put together for a little fun and information. 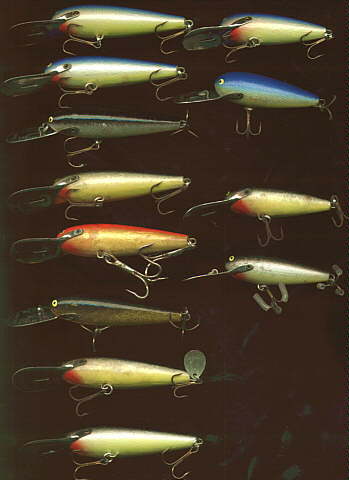 Here's a image of several of the Deep Diver 90 series I have in the collection. 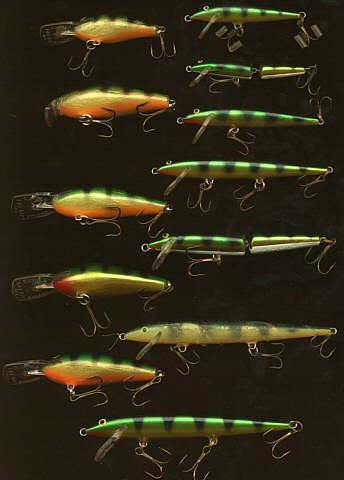 There are both sizes and most of the color patterns available for this lure. 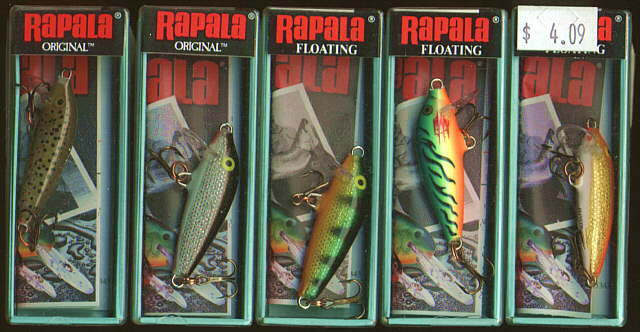 A group of Rapala's in the perch pattern. Floaters, Jointed, Fat Rap's and a Shallow Fat Rap. 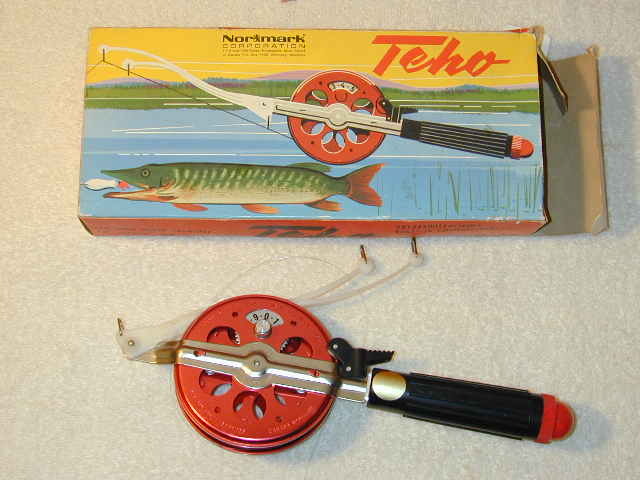 If you notice, there is a difference in the perch patterns. 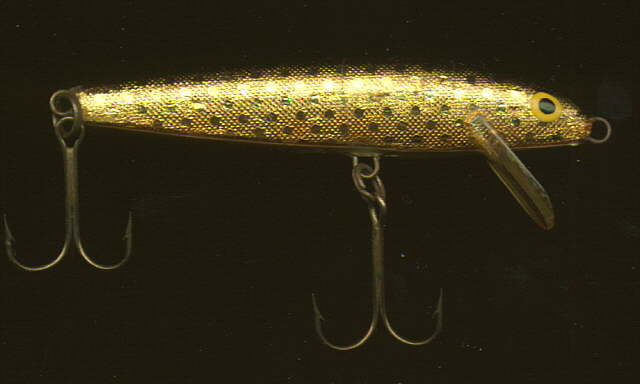 The older ones have what I call the Perch (goldtone) pattern rather than the orange belly perch pattern. A group of 5 Pilkki's. Showing all the different packaging that I have in my collection. I do have quite a few of these. 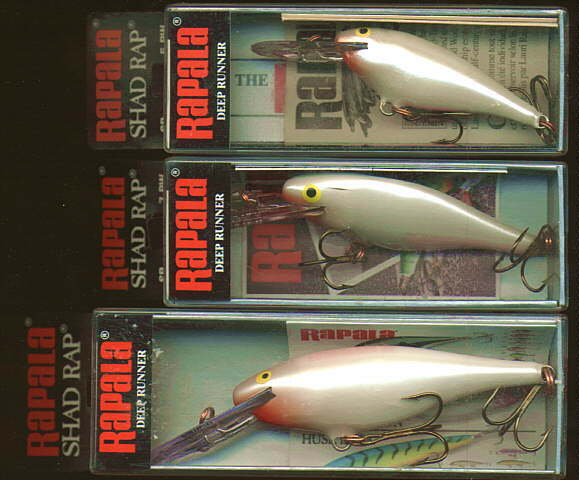 A group of Rapala Shad Raps in PW (Pearl White)I now have 3 different sizes of them, A #5, #7 and a #8. 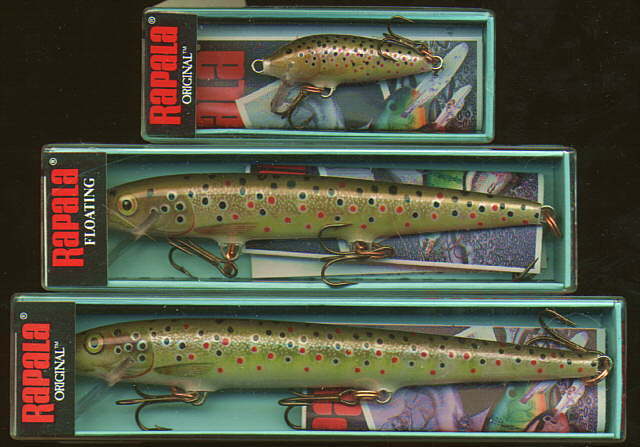 I'm still trying to locate more of these and a couple of other Rapala model styles that also came in this color pattern. 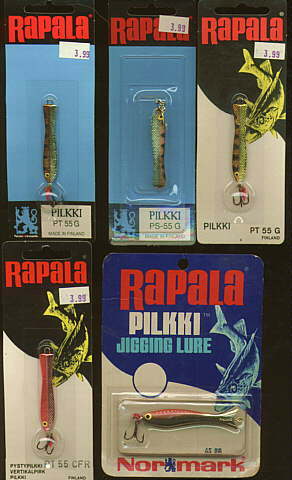 The next scans will be of Rapala lures that I plan on using quite a bit this season. When I first heard that Rapala was coming out with this new size. I couldn't wait to get some. Last summer I took a lot of, gills, crappies and other sunfish on a #5 Rapala floater, so I can only guess that this new size will be great (plus I love to use my Ultra lite outfit on panfish) Also this new size is marked on the bottom in black print. Another color pattern I have waited to get my hands on. All 3 of these floaters are in the new (here in the USA) Trout pattern. More like a brown trout. I believe that I'll be able to C/R quite a few bass with this lure. 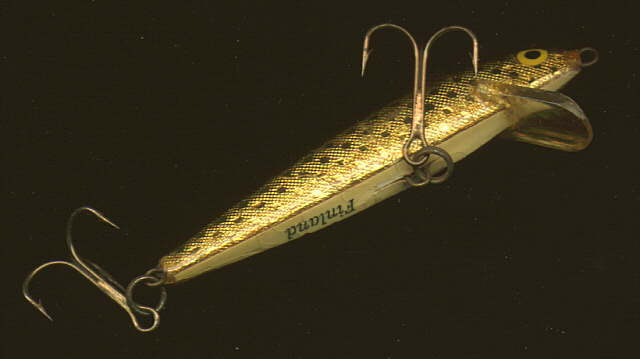 I also know that I'm still looking for "older" versions of this lure. 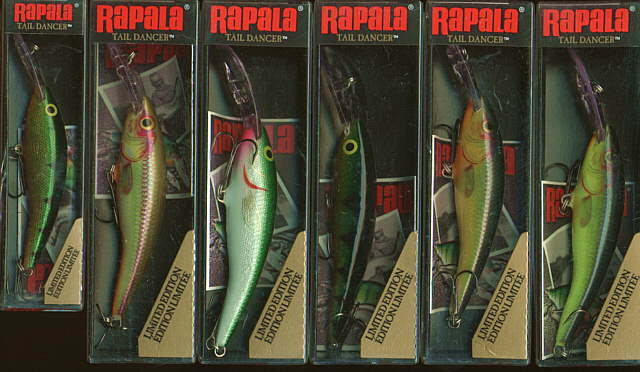 The older ones will be marked "Finland"
Rapala rapflash and Lime FrogA couple new Rapala that have been added to my tackle box. 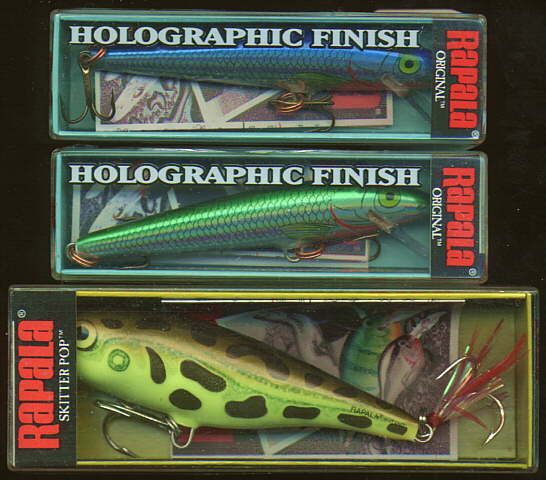 A couple of Rapala floaters in the new rapflash color patterns and a Rapala Skitterpop in the Lime Frog (lf) color pattern.